A well-defined site structure makes the job of search engine crawlers easier and this means better indexing and more chances in achieving higher rankings. With the introduction of artificial intelligence in the Google ranking algorithm, voice search and mobile first index, the structure of a website has gained more importance than ever. It’s no longer enough to have pages thrown on a website but these have to be grouped properly into categories so that search engines can understand for which topics you want to rank for. 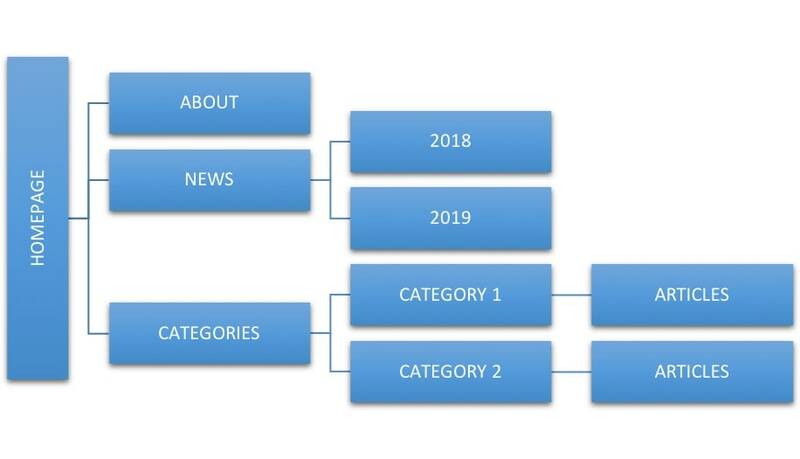 Keywords are still important for rankings but equally important is topic relevancy and one of the ways to achieve this is through a good site structure. The structure of a web site, blog or ecommerce store is very important both in terms of SEO and usability. It should be user friendly, easy to navigate, fast and serve its purpose: attract new customers, get more email subscribers, make a sale, get revenue from advertising or just present the information in the best possible way. A good site structure helps search engine crawlers read, index and understand your website faster and this improves your chances of ranking in search engines. They discover your website on the Web. They try to figure out the structure of the site so as to get a better understanding on how your pages/posts are related and which pages of your site are more valuable than others. When you have an optimized structure, you make this job very easy for them and this means better exposure. If on the other hand your site structure is flat, search engines can still index your pages but they won’t have enough clues as to how your pages are related. 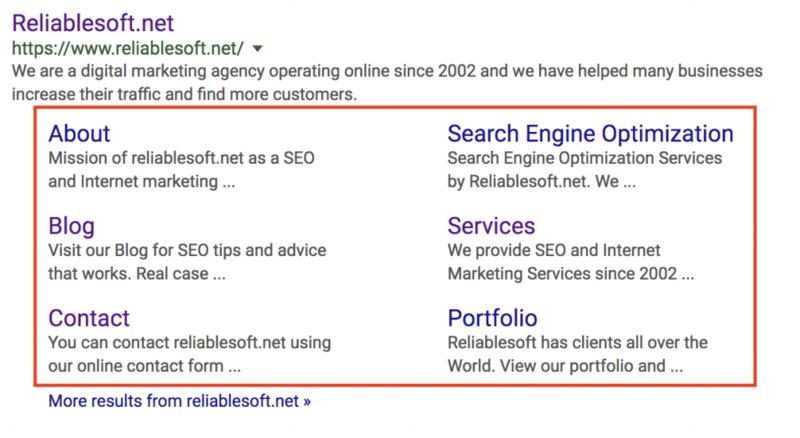 Sitelinks are links shown below the description of your snippet in Google Search Results that point to other pages on your website. They are a great way to make your search listings more prominent and increase your CTR (click through rates). You cannot specify which parts of your website to be shown as sitelinks since these are automatically selected by the Google algorithm. The only way to get sitelinks to appear with your listing is through a good site structure. Google knows when a user clicks on your listing from Google search, visits your page and then goes back to Google search without interacting with your website. For them, this is a signal that users are not happy with the results and eventually this will lead to lower rankings. Besides the home page and the other pages like about us, contact us etc., blog posts should be grouped into categories according to relevancy. For example, if you have a food blog publishing different kinds of recipes, you can create several categories based on the type of recipes i.e. Italian recipes, vegetarian recipes, Chinese recipes etc. The main purpose of a small business / corporate website is to provide more information about the business, it’s products, services and departments. Notice that you have a main category for departments and a main category for the blog with several sub-categories. A news website such as an online magazine can group content into a number of categories based on the type of content and when it was published. This structure can help both search engines and users find what they want either by visiting the category of interest or navigating through the content by date. The site structure of an ecommerce website can be a bit more complicated than other types of websites especially when it offers a number of different products. On top of the structure we have the homepage and then the content grouped into several categories. There is no limitation as to the number of categories or subcategories you can create but a rule of thumb is not to create more than 3 levels of depth in your hierarchy. In other words, each product should be accessed from the homepage in less than 3 clicks. This makes indexing faster and easier to understand by crawlers and it’s also friendlier for users. If you are starting a new website then it’s easy to plan the site structure in advance. From experience, this step is overlooked by many web designers and webmasters. They tend to concentrate on the visual aspect of a website without taking into account the structure. 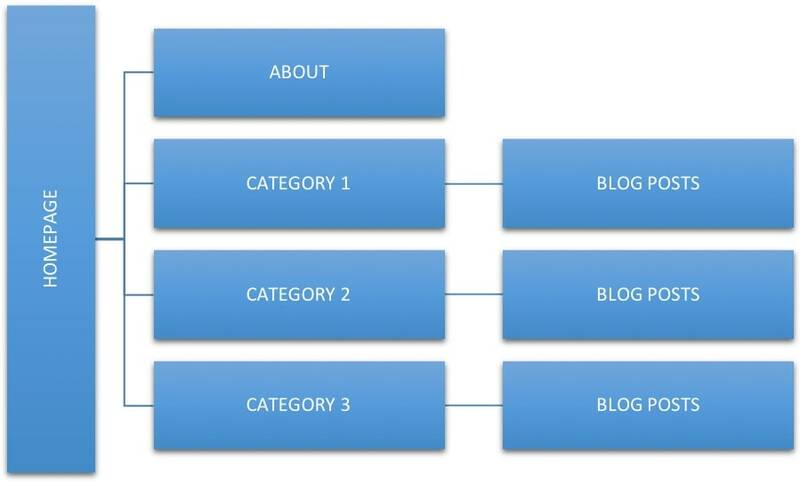 For example, blog posts should be grouped into blog categories and placed under the ‘Blog’. News articles can be grouped by published date. If you are offering services, these can be grouped under services. There are some rules to follow when creating categories, either for the products and services you are offering or for your blog. The first rule is that you NEED to have categories. The reason is simple: It makes it easier for users to find the content they are looking for and for search engines to crawl and index a website. Try to keep your categories the same size. If a category is too big because you have a lot of products or blog posts about that topic, try to break them into two or three categories. 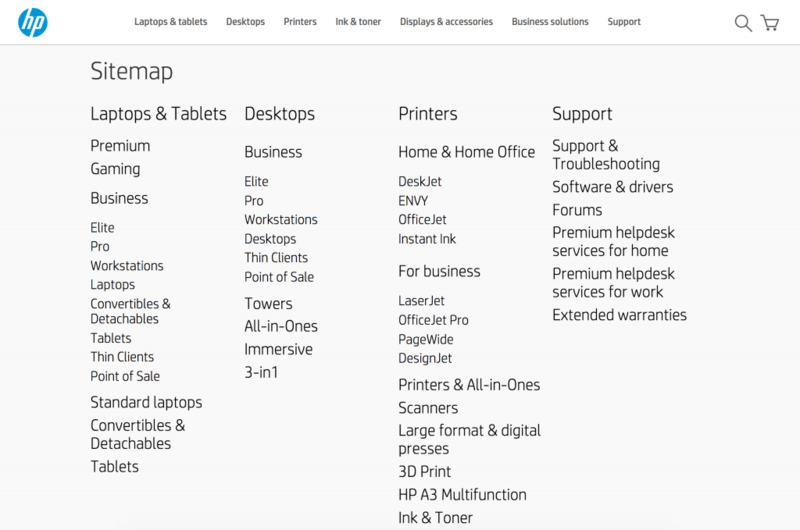 Add your categories in the menu of your website and homepage. Don’t try to hide your categories but make sure that your main categories are accessible from the main menu and linked to from the homepage. 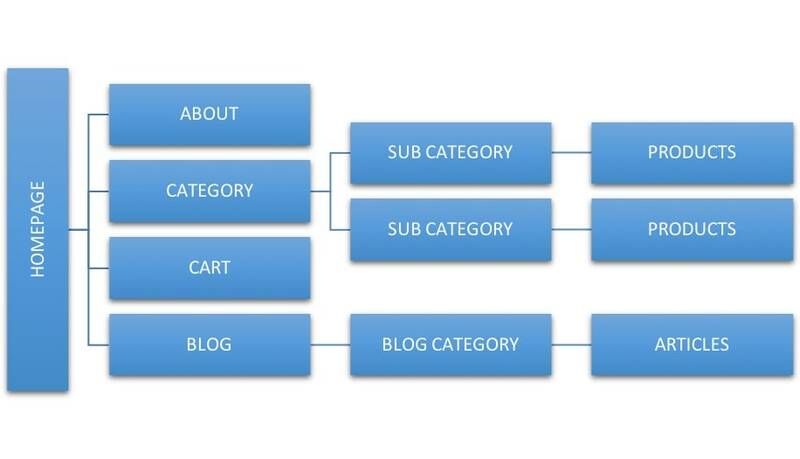 Use categories to create content relevancy. This is true especially for blogs. One of the reasons for creating categories is to build topic relevancy and help Google understand for which topics you want to build authority. Add internal links pointing to your category pages. For example, look at my SEO Articles category. Notice that I have changed the slug of my categories from ‘category’ which is the default value to ‘articles’. Why? Because it makes more sense. The category has an optimized title, optimized meta description and a short introduction. Besides listing my latest SEO articles, I have created groupings of the most popular articles. These groupings have proper headings (h2). As a result, the category page is ranking for a number of terms including SEO Articles and Latest SEO articles. Also, don’t use images to create your navigation links but use text. This means that if you want to link to a category page from your homepage don’t just add an image and link to it but have a text link as well. Breadcrumb menus are important for SEO. Google has many times mentioned the need to have a breadcrumb menu on all your pages so that users can navigate the site easily. In other words, the menu should display all levels until you go back to the homepage. Add structured data to describe the breadcrumb menu to search engines. There is a special type of markup for breadcrumbs that gives search engines more information about your navigational structure. Google can use this information to enhance the appearance of your search listing on both desktop and mobile. 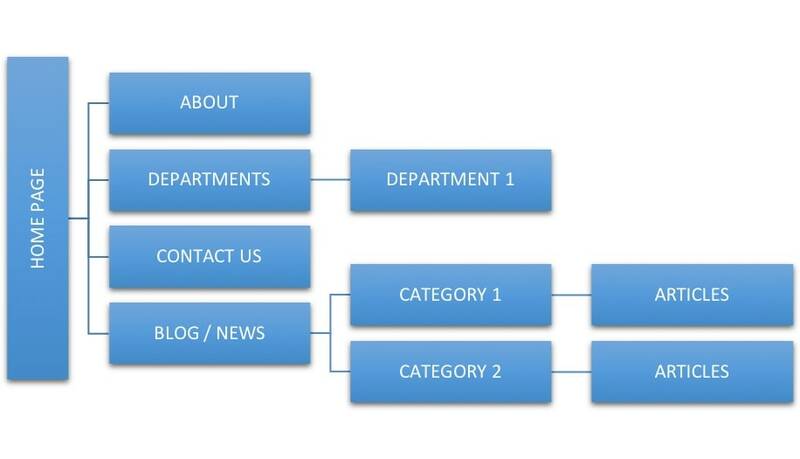 When creating your site structure, you should also think about your permalink structure. Your goal is to create SEO friendly urls that match your site structure. Don’t confuse the logical structure of a website with the URLS of the category pages and the actual URLS of single pages. In the above example, the URL of a single blog post could be: myfitnessblog.com/how-to-lose-weight. Notice that the category name is not included in the URL because It doesn’t have to be included. It’s friendlier to users and search engines to keep your urls short and precise. Google can understand the category of the article from your sitemap and breadcrumb menu and. One of the ways to make your site structure stronger is to make good use of internal links. In the beginning of this post, I have mentioned that search engines during the crawling process start from the homepage and follow any links to discover and index more pages from a website. Having internal links to the rest of your pages makes their job easier. Identify your most valuable pages (others refer to this as pillar content or cornerstone articles) and link to them from other related pages of your website. At any point in time, these should be the pages on your website that have the greater number of internal links. Hint: You can view the internal links report in Google Search Console to find out how your internal links are currently distributed. From your category pages make sure that you link to the most valuable pages of that category. See how I have organized by SEO Articles category page where the most valuable posts are displayed on top of the page. You can use optimized anchor text for your internal links. For example, if you want to link to a category on your website that displays athletic shoes, you can safely use the following anchor text “Athletic shoes” when linking to that category. Unlike external links, Google will not punish you for using optimized anchor text for internal links. Make sure that ALL pages of your website can be reached through internal links. A page that has no internal links will probably be ignored by Google so make sure that all your website pages have internal links pointing to them. Here is an example of good and poor internal linking practices as explained in my SEO Tutorial. This is different than the XML Sitemap you need to create and submit to search engines. In your website’s footer you can include an HTML sitemap that shows the website hierarchy to users. If you already have a website that ranks in Google, one of the challenges you will face is how to change your site structure without losing your existing rankings. While there are a number of actions to follow to protect your rankings, there is always a risk involved when changing either the content or structure of an existing website. So, you need to have a good plan to follow to minimize the risk. Before changing anything make sure that you have the full picture in your mind as to what you want to achieve. Don’t just go and create a new category because you realized it’s a good idea but first think how your overall structure should look like and then start making changes. Use 301 redirects in case you are renaming or removing categories or changing URLS. A 301 redirect instructs search engines that a URL of the page has changed. Search engine crawlers will update their index accordingly. then you should add the following 301 redirect in your .htaccess file or using a redirects plugin. Submit your updated sitemap to Google. Once you are done making changes, login to your Google search console and submit your updated sitemap to Google. You can optionally request a ‘Fetch as Google’, to force Google to process your changes faster. When working on your SEO, you should always have in mind that SEO takes time to work. It may take weeks or months to see the outcome of the changes you are making to your site today. Yes, Google will pick up your changes pretty fast but until they are fully processed, it may take a lot of time. It is also important to set your expectations correctly. By changing your site structure, it does not mean that your rankings will skyrocket. 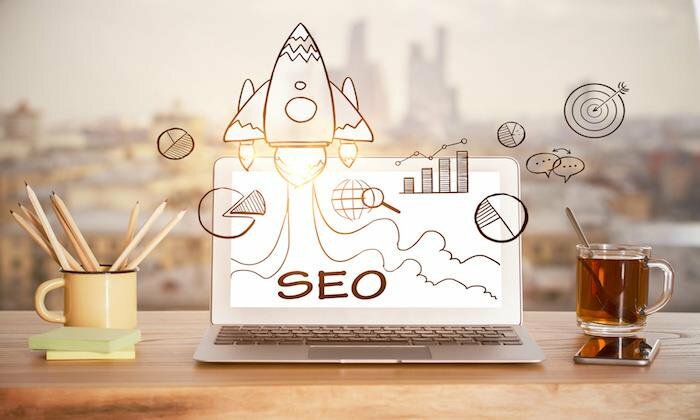 Following best practices and solid SEO techniques it’s a step towards the right direction but for overall SEO success, a number of other factors are taken into account. A good site structure is nowadays more important than ever. In the past we used to create flat websites with lots of pages targeting specific keywords but that’s no longer the case today. Things have changed. Competition is intense in all niches and with the introduction of machine learning, mobile first index and voice search, it’s important to give search engines more clues about the topics (and not just keywords) you want to rank for. And the best way to do this is by having a well-defined and solid site structure. 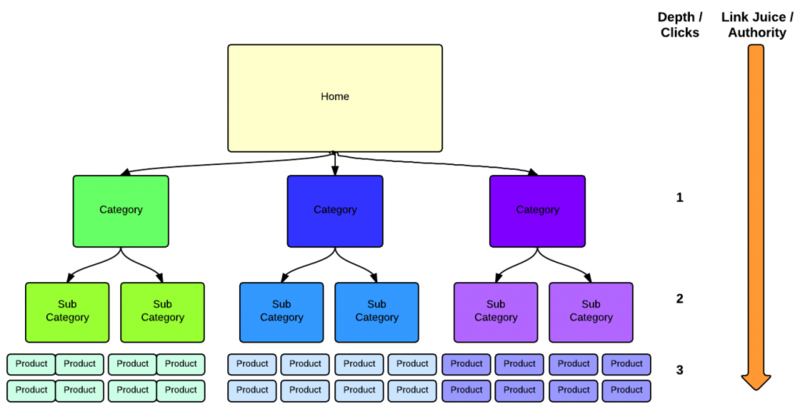 A website site structure should be hierarchical and easy to use. The starting point is the homepage and all other pages should be grouped into related categories. Users should be able to reach any page of the site by following links of the homepage. Website categories need be SEO optimized and added to the navigation menu. Internal links should point out to users and search engines the most valuable content of a website and also help them identify how the website is structured. If you haven’t done an audit of your site structure yet, then this is a task to add at the top of your SEO checklist. Wow!!! Chris i must thank you you for this content. I have been battling with how to categorize my posts on my own blog, and it’s been giving me headache for a while now. Thanks for your comment. 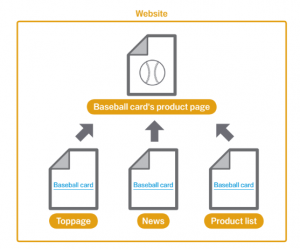 Yes, site structure is very important for SEO. It may be difficult at the beginning but once you get it right, you don’t have to deal with it again. I know I’ve worked at a few agencies where they just ignored site structure (even when we were the ones that made the site!) Glad to see others are realizing the potency of a well-laid site for SEO and even accessibility purposes. Thanks for a good post which I am finding to restructure my site. Google often changes the games, we need to follow. Now i came to know more potential about website structuring. thank you.